Please refer to our stock # 3226 when inquiring. 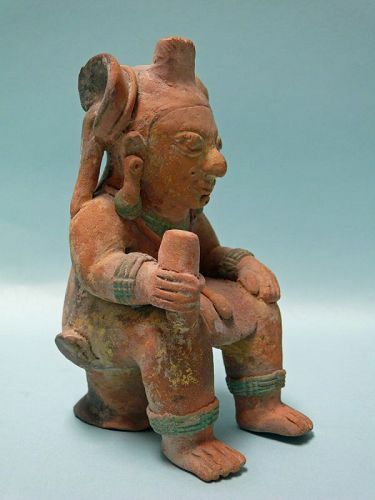 Jama Coaque Terracotta Seated Figure with elaborate Headdress, Ecuador, ca. 500 BCE - 500 CE. 6 3/4" x 3 3/4" x 4 3/4". Ex: Sotheby's New York. Some professional repair as seen in images. Otherwise in very good condition. Jama-Coaque community existed between 500 BCE - 500 CE and inhabited the areas between the Cape of San Francisco in Esmeraldas to the north of Manabi. It was developed in an area of wooded hills and wide beaches that facilitated their resource gathering members of both the forest and the sea. One of the most important sites are located in San Isidro, near Bay Caráquez. Although there is no direct evidence regarding how to build their villages and types of homes, researchers and archaeologists have concluded that their homes were built on hills, to "open the front and slightly concave summit, crossed by two short beams ... "(Peter I. Porras. - Ecuador Archaeology, p. 155). Its ceramic figurines are an invaluable visual record clearly reflects everyday life in Jama-Coaque. Their human forms, zoomorphic, blends human and animal, details of costumes and ornaments expressions, etc.. reveal some aspects of these distant lives. Many of these figures wear very colorful outfits getting to be an aboriginal fashion spectacular for its large headdresses, tunics that cover your legs and arms, necklaces, bracelets, earrings, and a very elaborate feather art. Also worked gold and other metals with very delicate and artistic technique is shown in ears, necklaces, pectorals, nose rings, helmets and wrist guards. Expressive and aesthetic richness of their representations in gold and ceramics has been stating that Jama-Coque is a very baroque indigenous culture, and to consider it as an important center of the ancient art of Ecuador. The presence of many objects like clay mask fantastic feline and human representations, figurines representing key figures such as priests, sorcerers and shamans models of possibly ceramic temple models, show the great importance they had in the culture Jama- Coaque ceremonial rituals or cults, constitute important forms of mediation between the human and divine. In Jama-Coaque culture manifest some of the old customs ceremonies Americaindigenous, closely related to music and dance, which gave a more religious or aesthetic magic. Some Jama-Coaque figurines of musicians and dancers, for its beautiful slopes and complex ceremonial attire suggest this importance.